PigCHAMP continually strives to save producers and staff time and money by reducing data entry and keying errors. One of the ways we do this is by working closely with allied industry partners - such as genetics suppliers, feed companies and packers - to allow for free and easy exchange of data. 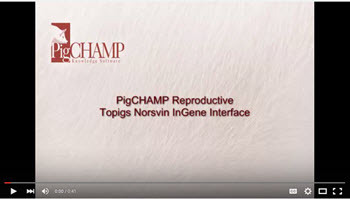 New to PigCHAMP Reproductive is a feature to allow for simple data collection and transfer of information to Topigs Norsvin's InGene program - elminating the need for joint customers to enter data twice. PigCHAMP also has interfaces with a number of other genetics suppliers. In the Grow-Finish software, customers will now be able to quickly and easily import information that they receive from their packers and feed mills. How does your herd compare? For more than 10 years, PigCHAMP has collected and aggregated data from more than 1 million sows in our Benchmarking Program. The 10th anniversary edition of Benchmark Magazine features an Overview of 10 years of benchmarking data by Dr. John Mabry from the Iowa State University. Visit www.pigchamp.com/benchmarking to view summaries from US, Canadian and International herds from over the past 10 years. This service is offered free to PigCHAMP customers, who receive customized quarterly and yearly benchmarking reports. For more information, visit the PigCHAMP website or email Susan Olson. PigCHAMP products are sold and supported by a global network of agents and distributors. As part of our new blog, we will be introducing you to these valued members of the PigCHAMP team and sharing their personal stories about their businesses, their customers and their global cultural experiences. This month, we're featuring Natasha Ferguson from PIC South Africa. Natasha will be blogging about her adventures as she travels halfway around the globe to the PigCHAMP office in Ames Iowa for training.